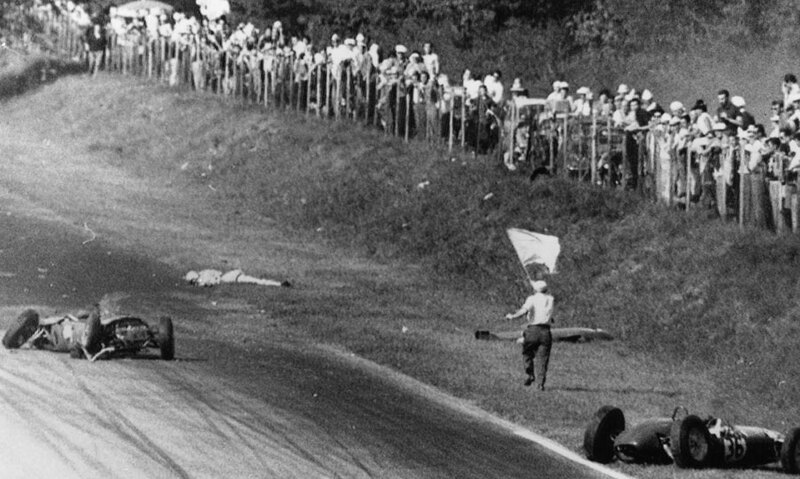 Tragedy struck at the Italian Grand Prix when championship leader Wolfgang von Trips was killed, along with 14 spectators, in a horrific crash also involving Jim Clark. The only son of an aristocratic Rhineland family, von Trips had always been driven by an urge to prove himself in competition and "to do dangerous things", hence gaining the nickname 'Count Crash' in his early days of racing. With von Trips' death, the world championship was handed to Phil Hill, who won the race comfortably. For the last time in a grand prix, the Italians were using the 6.2 mile version of the Monza circuit, which combined the main track with the notorious banked section, so disliked by the British constructors that a year earlier they had boycotted the race in protest at its continued use. Ferrari was out in force with no fewer than five cars - the three regulars of von Trips, Phil Hill and Richie Ginther - as well as two privateers, Giancarlo Baghetti and a highly promising young Mexican Ricardo Rodríguez, making his grand prix debut. Those five Ferraris took the first five places on the grid, with von Trips on pole. At the start it was Phil Hill who shot into the lead but disaster struck on the second lap, ironically on the road circuit section of the track, not on the high-speed banked concrete bowl. Travelling almost side by side at 140mph, von Trips' Ferrari and the Lotus of Jim Clark touched wheels as von Trips appeared to veer in front of Clark. The Ferrari somersaulted, mounted a bank and hurtled into a spectator fence, killing von Trips and 11 other people instantly. The car then shot across the road, spinning wildly before coming to rest in the middle of the track. Remarkably, Clark was unhurt, although his car was badly damaged. A shocked Clark later told reporters; "Von Trips and I had been passing and re-passing each other. As we approached the bend, he was almost level with me on my right. He suddenly pulled right across in front of me, and although I had two wheels on the verge, a front wheel touched his rear wheel. What happened then, I don't know". On the next lap, John Surtees had an accident at almost exactly the same spot, when his Cooper collided with Jo Bonnier's Porsche and ended up hitting a wall. Surtees was unhurt, but Gerry Ashmore was not so lucky when his Lotus crashed, again on the same stretch of road, and he was taken to hospital with head injuries. Away from all the chaos, Phil Hill led the field with team-mate Ginther close behind. Stirling Moss, driving a works Lotus lent to him by Innes Ireland, was having his own private battle with Dan Gurney for fifth place, and for the next 37 laps they went at each other without respite, sometimes only feet apart. On the 14th lap both Baghetti and Rodriguez retired, so Gurney and Moss were now disputing third, behind the two Ferraris. Ginther's car gave up the struggle on the 24th lap, leaving Moss to challenge for second. He looked all set to take six precious championship points when on the 37th lap he retired when a wheel bearing overheated and seized up. Phil Hill won by over 30 seconds, and with it the title of World Champion, the first American to ever achieve that feat - but there was scant rejoicing on a bleak day for grand prix racing. With both drivers' and constructors' titles in the bag, Ferrari immediately ended their season.